Tonight’s Thursday night game actually has the potential to be a high scoring affair as the Falcons hit the road to face the Buccaneers. While both teams have the ability to move the ball offensively, their defenses have certainly struggled. There is a chance that this one will come down to which team’s defense is able to step up and either force a turnover or have some crucial stops. The Falcons passing attack has been one of the most dangerous in the league to this point and they have another great matchup tonight. Matt Ryan seems to be much more comfortable in Kyle Shanahan’s offense and it certainly shows. The case could be made he is the league’s MVP at the halfway point. While Ryan’s deep passing has improved, the Buccaneers defense has struggled in this regard which should lead to some huge opportunities. Ryan could end up as one of the top fantasy quarterback plays this week. Obviously the main beneficiary of all this at first glance appears to be Julio Jones. Few wideouts can win in all areas of the field the way he does, and his ridiculous physical gifts are just a cherry on top. While defenses can gameplan to basically to essentially take him away (see the Packers this past Sunday), Ryan is a good enough quarterback he can make the defenses pay. Obviously Jones should be used in all fantasy formats. If the Buccaneers do try to eliminate Jones, Mohamed Sanu should see an uptick in targets. Sanu at the least should see five to seven balls thrown his way, but makes for a risky fantasy play. Having your offensive role depend on how defenses cover your teammate, and clearing 50 yards just twice for the season can do that. With Jacob Tamme ruled out, Austin Hooper could be in for a solid showing.The rookie from Stanford has been efficient in the small sample size he has had this year, and with tons of notable tight ends on bye he is worth a look in fantasy formats. Facing a run defense that’s around league average paired with Tevin Coleman being out, Devonta Freeman appears to have a pretty nice matchup tonight. Considering Freeman can contribute in the passing game as well, and should receive at least 15 to 20 touches tonight (maybe more depending on game-flow), he is a must start this week. Terron Ward will see some work in the ground game, but chances are it will only be a handful of touches which isn’t worth fantasy attention. The last time these teams played in week one, Jameis Winston had arguably his best game of the season. An opportunity for another big outing is there, so if you’re streaming a quarterback this week, he makes for a great play and should be a value in daily fantasy leagues. Even with a few of his best weapons out, Winston likely will have to throw early and often in this one. A big part of that is that the Buccaneers running game has been decimated by injuries. The team on the ground is now down to Antone Smith, Mike James and Peyton Barber. Even with a nice matchup, this is clearly a situation to avoid for fantasy formats. If I had to guess, Smith and James should see the majority of the work but neither has a guaranteed role to be trusted. 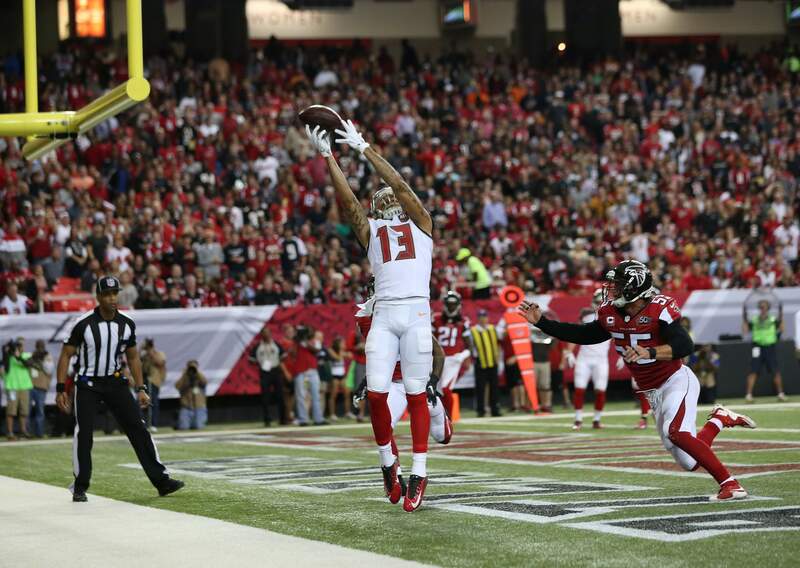 One Buccaneers playmaker who you can certainly count on is receiver Mike Evans. Not only is Evans a great talent, but the volume is certainly on his side as he’s basically a lock for double digit throws his way. But then again, who else does Winston throw to? Vincent Jackson is out for the year, Russell Shepard is listed as doubtful and Cecil Shorts while expected to play, has struggled with injuries throughout his career. Winston may look to Adam Humphries and Cameron Brate. Both options are tough to trust for fantasy, but if I had to pick one it would be Brate. As previously mentioned, tight end is a shallow position this week and Brate tends to get some looks in the red zone. As a whole, the Falcons offense is healthier and that is what has me picking them in this one. While Winston is certainly capable of going score for score with opponents, there is a chance his supporting cast for this one isn’t the bunch to do that with. My prediction is Falcons 27 Buccaneers (+3.5) 21. This entry was posted in NFL, Picks against the spread, week 9 predictions and tagged 2016 week nine fantasy football predictions, 2016 week nine predictions, Adam Humphries, Antone Smith, Atlanta Falcons, Austin Hooper, Cameron Brate, Cecil Shorts, Devonta Freeman, Jacob Tamme, Jameis Winston, Julio Jones, Matt Ryan, Mike Evans, Mike James, Mohamed Sanu, Peyton Barber, Picks against the spread, Russell Shepard, Tampa Bay Buccaneers, Terron Ward, Vincent Jackson. Bookmark the permalink.